Pruning: Group 1 A fantastic, evergreen, twining climber, with handsome, long, lance-shaped leaves that will cloak a wall or fence within a few seasons. 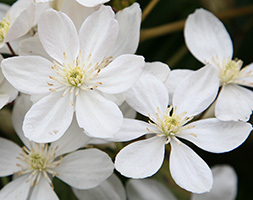 In early spring, it&apos;s smothered in fragrant, four-petalled, star-shaped white flowers and the new leaves are bronze-tinted. Plant near a doorway to enjoy the scent, and give it plenty of room to spread out.